When it comes to creating deliciousness for your next dinner party or date night dinner, cedar planked salmon is the perfect choice. The smoky-spicy flavor from the cedar plank will make your dinner a delicious event! This is a sponsored post on behalf of Gustus Vitae. All opinions are honest and 100% my own. Make your next date night memorable and cook up deliciousness with my Cedar Planked Salmon! 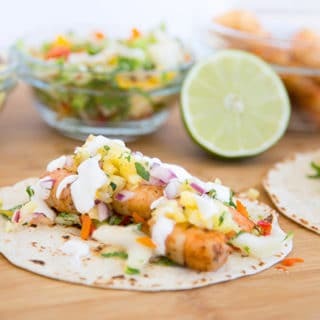 I used one of my favorite seasonings to give the salmon that perfect blend of Jamaican flavors. 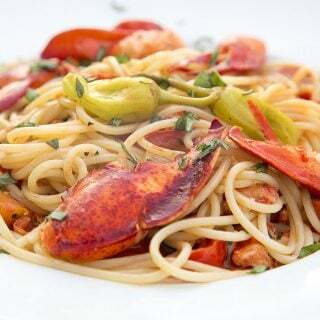 And with all the wonderful Gustus Vitae seasoning blends you have to choose from, dinner will never be boring again! 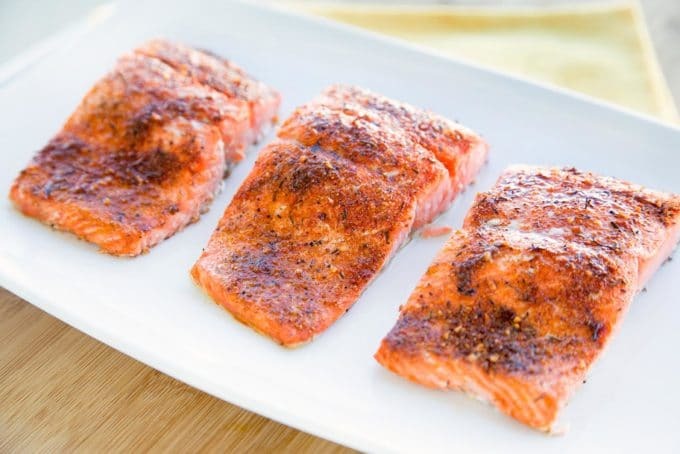 Whether you make this salmon for a date night, entertaining or just to treat the family to a special dinner, you’ll be amazed at the results and just how easy it is to make planked salmon! Finding good quality seasonings is not as easy as you think. Most of the seasonings you find in grocery stores have been sitting on their shelves for months if not years. And you never really know how well they’ve been sourced. I was lucky enough to find Gustus Vitae on Amazon and you all know I’m a serious Amazon Prime shopper. So, not only am I able to buy fresh and unique seasoning blends, I get them delivered right to my doorstep. Cooking planked salmon is really very easy, there are just a few things you need to know to be successful. 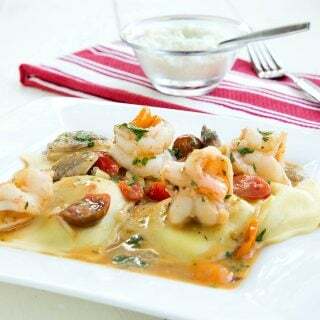 -Let’s gather the ingredients together that we need to create this dish. The first and most important thing to know is, you have to soak the cedar plank in water for at least 1 hour, preferably 2-3. This will ensure that the plank doesn’t catch on fire. 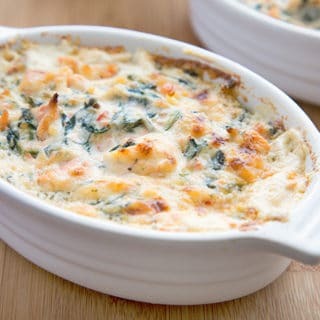 While this is not as critical if you’re making this dish in the oven, it’s still something you need to do to create the right cooking atmosphere. When the soaked planked is placed on the hot grill or in the oven it releases the moisture along with the aromatic oils that are picked up from the wood during the soaking process. 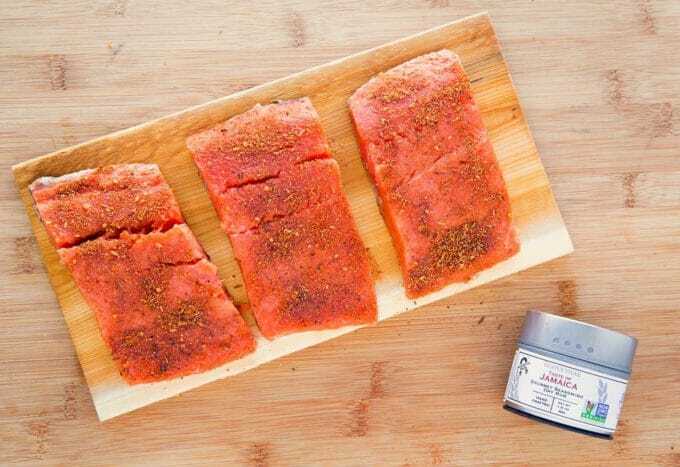 This cedar infused steam helps cook and flavor the fish while adding moisture into the fish. 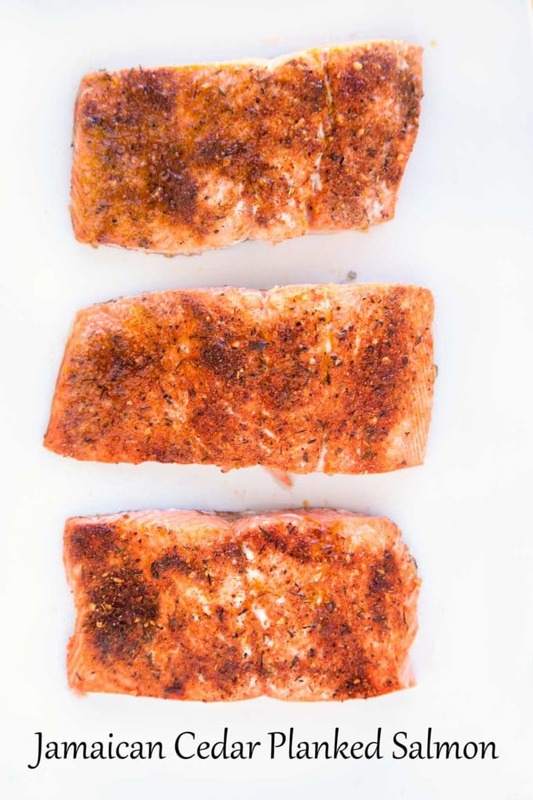 This gives you an incredibly moist and tender piece of salmon. 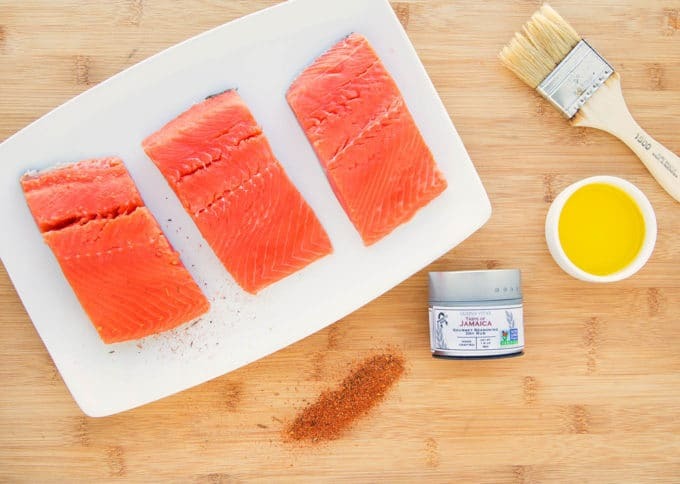 If you’re cooking the planking salmon on the grill, it also adds smoke. The spicy and fragrant cedar smoke helps cure the outside of the fish and locks in the moisture. 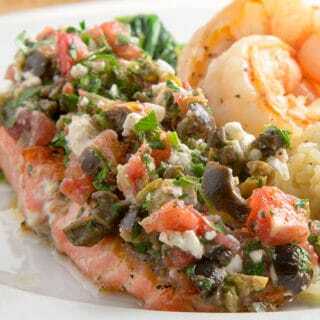 Giving you a perfectly cooked flavorful piece of salmon. Another tip is to use as much of the plank as you can, without overcrowding it. Most planks are 5 x 11 inches, but you can find some larger pieces for grilling whole sides of salmon on Amazon. The end result will be as close to perfection as you can get. It’s so easy to do, you don’t have to wait for a special occasion or be afraid of making 20 or 30 pieces for your next get together. You don’t even have to skin the salmon before cooking. The skin will peel right off when you take it off of the cedar plank. They have a lot of delicious seasoning blends and Sea Salts to choose from to help keep your cooking fun and flavorful! I also love that Gustus Vitae seasonings are All Natural and most are Non-GMO Certified. They are completely free of artificial colors, flavors and MSG. And are not irradiated or treated with ETO gas. The metal containers with their magnetized bottom are the perfect size for my spice drawer and they even used recycled paper labels. 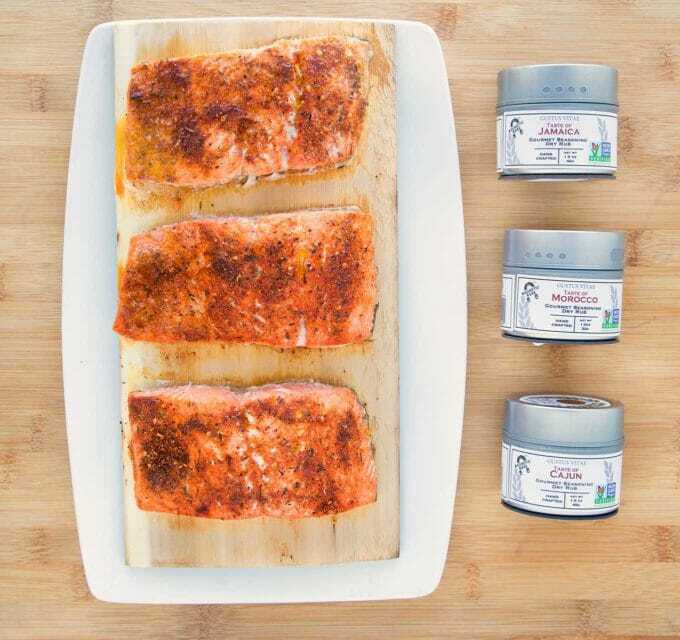 What more could you ask for than handcrafted small-batch seasonings that are sustainable and delicious? If you’ve tried my Cedar Planked Salmon recipe or any other recipe on askchefdennis.com please don’t forget to rate the recipe and let me know where you found it in the comments below, I love hearing from you! You can also FOLLOW ME on Instagram @chefdenniseats and @chefdennistravels, Twitter and Facebook. Soak the cedar plank (completely submerged) for at least one hour. 2-3 hours is preferred. 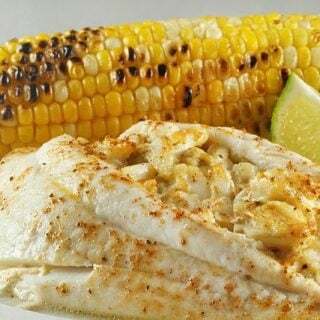 brush salmon fillets with olive oil and sprinkle with Jamaican seasoning mix. 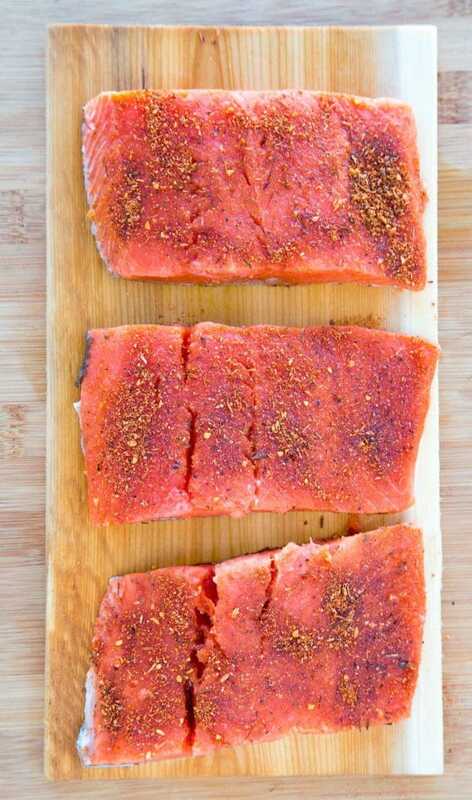 place salmon on plank and set plank in a preheated grill (450 degrees) and close the lid. Cook the salmon for 15-18 minutes to the desired doneness. 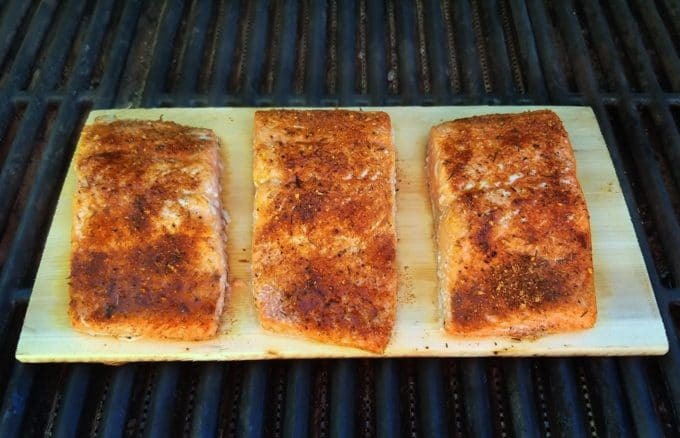 remove salmon fillets from the cedar plank. The skin should peel off easily. Discard the cedar plank after it has completely cooled. Looks delicious Chef and I have some nice salmon in the freezer to use. Thanks Larry, I was surprised how much the cedar planks helped the salmon. Enjoy!! Hi, I am fan of urs food n i would like to know that do u buy chilly powder?? So please reply me ASAP. Yes I do use Chili Powder from time to time.